MOST ALL OF THESE FUNNY PRODUCTS ARE ON SALE AT BLOWOUT PRICES!! We are selling out many of these clever and funny products from our Bush Store at reduced prices. Now is the perfect time to buy yourself and your friends a unique parting gift from the Bush Administration. Supplies are very limted on most of these items so get them while you still can. All products marked with free shipping are for sales within the U.S. only. To view our product guarantees and return policy please visit about us. Here's how to order by personal check or M.O. 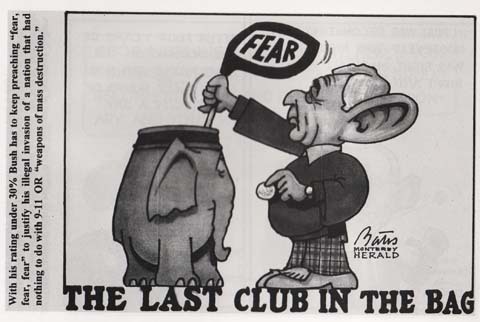 The Burning Bush Fire Starter - Toast the former President Today! and is best used giving Bush one final heave-ho this winter! Description: This fire starter is a composite of paraffin and sawdust with a wick in the back for easier ignition. Each one weighs more than half a pound and will easily light any fireplace or bonfire. Of course, with the decorations they are considerably more fun to burn than normal fireplace logs. These fire starters burn for 15-20 minutes. With the wick lighting them from the back, the flames come from the top and the side and the face takes a satisfyingly long time to burn off. With winter still raging, now is the perfect time to buy one of these funny kits. CAUTION: Use only when NOT under government surveillance. There's still plenty of enjoyment to be had watching Bush's face burn in your fireplace. These make great house-warming gifts too! Hang in there--it’s almost over! 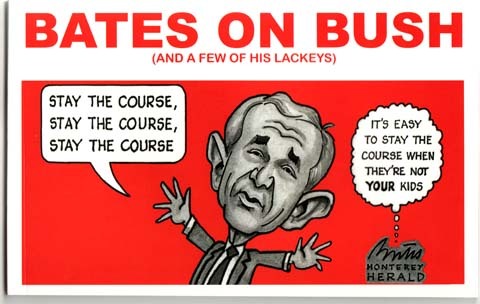 Twenty-four hilarious postcards will help you count down to the bitter end of the Bush presidency. Goofy photos and the best of Bush bloopers, blunders and tortured syntax will get you to that long-awaited, fabled day: January 20, 2009. "In terms of timetables, as soon as possible, whatever that means." These are very high quality glossy colored postcards. Both the photos and their captioning are clever and very funny! This item will make a great stocking stuffer. Now on sale for only $4.95 with FREE shipping and handling. Actual Image Size on Poster: 17-1/2" x 27"
Close-out price of only $5.95 each - These are large posters! Shipped by first class mail. Deception Dollars - Two Different Clever Designs! DECEPTION DOLLARS are near-perfect replicas of real money - only a bit larger. We have fun passing them out to strangers, posting them on bulletin boards, or leaving them on tables along with tip money for the waitstaff to find. Almost everything on these bills has been slightly altered to expose the corrupt Bush Administration. It's even more fun when you get out the magnifying glass, to read the hidden little messages and informational web addresses on these bills. Lots of enjoyment and well worth the price! They also make a perfect gag gift for your politically inclined friends. Just click on each bill to view the front and back of each design on a larger image. To order Deception Dollars use the below links for the quantity you want. The cart will give you options to choose the design. You can mix your order betwen the two designs on quantities of 50 or more. To mix your order, just give us instructions of how many of each you want in the "Special Instructions" box during checkout. The more you buy - the more you save! Regardless of the amount you buy, Deception Dollars sell with only our minimum shipping charge of .85 cents per order. We will mix and match if you leave us instructions of how many of each you want of the two designs. Otherwise we will send you all of the same you have selected from the pulldown menu. Only $3.50 for 25 Deception Dollars with FREE shipping! Why play poker with just any "normal" deck when you can use one of these? 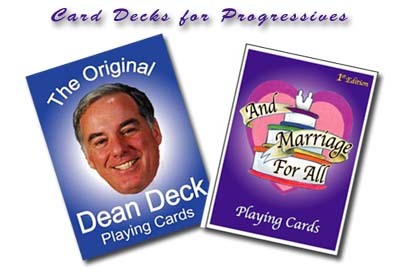 The Original Dean Deck has cards that recall and highlight DNC Chairman Howard Dean's energized and exciting campaign for President. It should become a political collectible. View some cards from this deck. The And Marriage For All deck pictured above is sold out! Description: Each deck is a casino-quality, regulation poker deck, containing 52 caricatures accompanied by quotes by or about the individual on the card. Decks were originally $9.95. Now only $2.50 each with FREE shipping and handling while they last. Where can you find any new deck of cards this cheap?